Honolulu Star-Bulletin writer Helen Altonn was presented the Healthy Mothers Healthy Babies Coalition of Hawaii's President's Award yesterday during a luncheon at the Hawaii Prince Hotel in Waikiki. 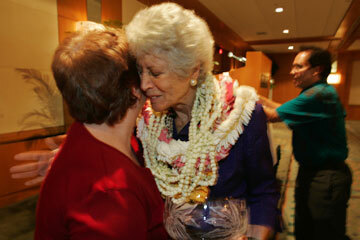 Altonn was honored for her contributions to the local health community and the health and welfare of Hawaii's people. Nancy Partika, left, the group's executive director, hugged Altonn after presenting her with the award.